As March ended, additional elements of the spacecraft and instrument payload were installed on the New Horizons spacecraft. 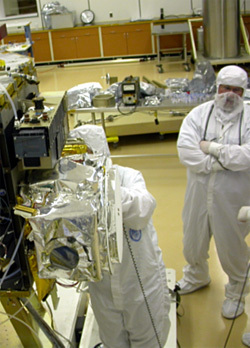 These included an array of heaters, inertial measurement units, a repaired flight computer, and the Ralph remote sensing instrument package. This is a major milestone for the project team! Thus, as April begins, New Horizons is ready to move from the assembly phase to integrated spacecraft-level testing. As a part of this, the spacecraft and its instruments — which in combination we call the "observatory" — will be put through its paces in a five-day "Comprehensive Performance Test," or CPT. In the CPT, virtually every function aboard the spacecraft is put through its paces. In all, this involves several hundred individual tests. While each piece of the spacecraft has been individually tested, both against their performance criteria and to the rigors that the hardware will see in flight, it is only now that the collection of parts plays together as a symphony. Following this, in early May, we plan to conduct an in-depth review of the detailed readiness of the observatory to begin environmental testing, and then move into that even more rigorous testing phase. During environmental testing, the observatory will be subjected to simulated launch vibrations, hot and cold thermal cycling (more demanding than anything it will experience in flight), and mission simulations and other performance testing in a room-sized vacuum chamber. Some of the environmental tests will take place at the Johns Hopkins University Applied Physics Laboratory in Laurel, Maryland, where New Horizons was designed and assembled. Other parts of this testing will take place at NASA's Goddard Space Flight Center in Greenbelt, Maryland. Environmental testing will continue through at least July to certify that all of the hardware and software aboard the observatory are ready for flight. And while all of this is taking place, our launch vehicle is under construction, detailed flight procedures and command scripts for the early phases of flight are being written (and tested) by spacecraft and instrument team members, and planning is taking place to knit together a tightly woven plan for our hoped-for Jupiter encounter in early 2007. This is an exciting time! It's also, obviously, a busy time. I like to say, "The road to Pluto and the Kuiper Belt isn't paved with bricks; it's paved with long hours."